On 30th September we are taking part in the Windsor Half Marathon to support Dementia Research at Exeter University. In England alone 1 person every three minutes will be diagnosed with Dementia. Although it is much more widely spoken about now, Dementia is still relatively underfunded and it has no cure. Dementia is a cause close to both our hearts. John, our beloved father and grandfather passed away in 2015 having suffered with Dementia for over five years. For over five years we saw our father/grandpa lose all of the memories that we hold so dearly. He forgot who his wife and his family were. As time went on he lost the ability to communicate, walk, feed or do anything for himself. Someone once said that Dementia is the cruelest disease for a family to experience because they watch while their loved one forgets the memories and experiences that have made them the person that they were. We really want to help transform the lives of people who have or who are at risk of developing dementia which is why we want to support research into diagnosis and treatment for this cruel condition. The University of Exeter has a specialist department carrying out vital research into understanding Dementia and getting us one step closer to finding a cure. More information about the important work they do can be found here . Now for the run itself, we were due to do it last year, but had to postpone due to injury. This is a first time for Louise, who until recently could hardly run a mile let alone 13 of them back to back (and both of us have a long way to get there before the end of September), but we’re hoping that this will be the perfect opportunity to raise awareness and celebrate John’s life . We will be carrying his memory every step of the way. 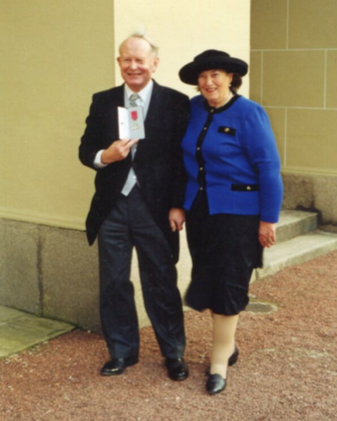 This was when my father received an MBE at Buckingham Palace for work he did leading the Consumer Credit Association. He looked so happy which is why i like the picture. What was so sad was that he was a really intelligent man who was setting and marking professional exam papers even after he retired, and he lost everything when he got dementia. Any amount will go a long way to finding a cure for this horrible disease, thank you for your support. Click here to give to Dementia Research at Exeter in support of Anne and Louise, or in memory of their father and grandfather, John.